Arriving in Anchorage April 25th, our mound of well-equipped baggage barely fit into our driver’s minivan. After the two plus hour drive up to Talkeetna we met with Paul Roderick of Talkeetna Air Taxi. 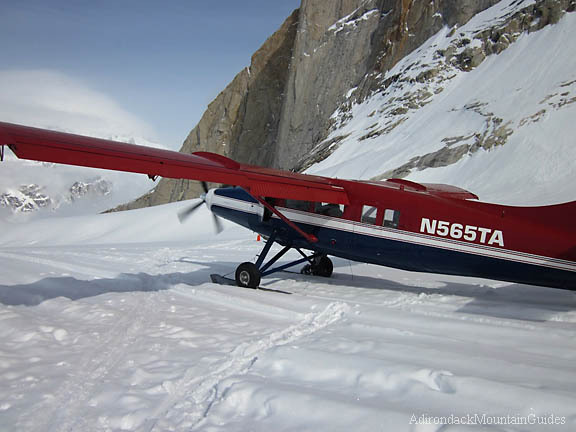 Paul is the pilot who pioneered landing on the Route Canal Glacier, which is just below the Moose’s Tooth. Like us, he was not sure about the weather. Reports coming in weren’t good, and the weather had been unstable with recent snowfall. The plan was to check back in the morning and we would fly if possible. Heading down Main Street, it was easy to tell that the summer season hadn’t kicked off yet. It was empty and quiet, even for Talkeetna standards. After a quiet night in the Road House bunkroom and an enormous breakfast, Paul brought us good news: the weather was clear enough to fly. Paul’s Otter pulled into the air quickly with just we three passengers and our gear in a half full plane. Twenty minutes up top had us inside Alaska’s Central Range and approaching the Route Canal Glacier. After a fast low pass, the plane banked a speedy hook around a small peak, and quickly we’re on the glacier. Paul makes it look easy and he’s cool and calm, a fact that makes this a fun trip rather than looking nervously over at a pilot who’s more nervous than you. Once you step out of the plane all a climber has to do is drag gear a hundred yards or so and set up. The routes are 10 and 20 minutes away from the camp, an approach acceptable to even the laziest of climbers. 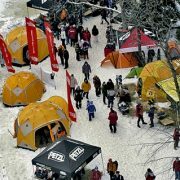 I felt guilty as Erik and I set up his huge Mountain Hardwear Satellite tent. Our partner Jay and everyone else camping on the glacier would be crawling in and out of the standard two-person, four-season tents while Erik and I would be lounging in the condo-like super tent. HAH! Did I say I felt guilty? Erik Weihenmayer, left, chats with Jay Abbey, right, in the giant condo-like tent Erik brought with him. As we settled into camp under blue skies, a couple of parties who had just finished climbing “Ham and Eggs” began arriving in camp. A familiar face among one of them was legendary Alaskan climber Jack Tackle. We chatted as Jack filled us in on the peak’s condition and gave us the bad news that “Shaken Not Stirred” was not in shape. Another party said they hadn’t left camp in the ten days prior. The weather was beautiful overhead but was deteriorating, leaving us questioning what tomorrow would bring. Nevertheless, we went to sleep early, even though it stayed light until 11:30 pm. 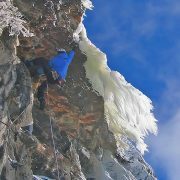 That extra light is one of the greatest features of Alaskan climbing, a feature we might need the following day. The rock faces of the Moose's Tooth tower above our camp on the Root Canal glacier. 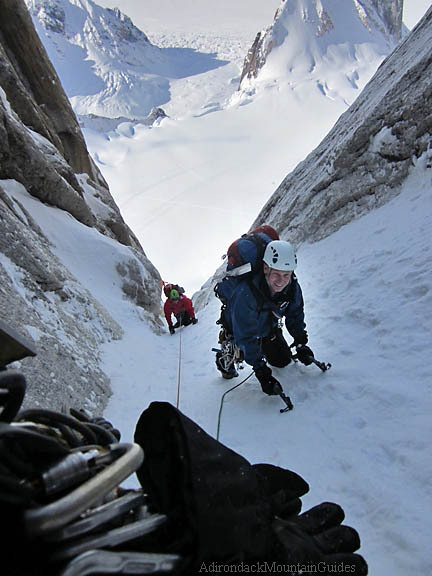 “Ham and Eggs” couloir, an Alaskan Grade V, 5.9, AI4, is a sought after classic described as having 18 pitches of steep climbing gaining 2500 feet in altitude and 3600 feet of terrain to reach the short walk along the corniced ridge to reach the summit. We woke at 3:30 a.m. Unlike my many past climbing partners, Erik is a neater tent mate and keeps everything in the same location. It’s no surprise to me that he is faster getting ready than the rest of us. We cook up a little “goat meal“, and then turn our sleepy faces toward the base of the route. Up we go. 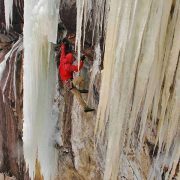 Several simul-climbing pitches of snow leads to the 5.6 rock crux pitch. The dry tooling here was easy and fun. The gear is good and Erik and Jay move quickly through the moves without delay. 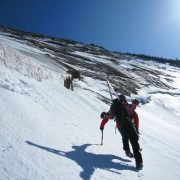 On easy snow again, the three of us returned to simul-climbing, taking the next 5 pitches with ease, mostly over frozen snow with the occasional steep bulge. The line of Ham & Eggs runs up a wide runnel, slowly narrowing as it ascends. For added safety, I stop occasionally to belay just before my seconds, Jay and Erik, reach a steeper section. Seven pitches off the glacier, the climbing begins to steepen and I opt left for the AI 4 pitch instead of the 5.9 pitch to the right. It seemed most tracks went right and when I approached the ice crux, I find out why. Here the ice was pretty baked. The 80 degree or so ice went up narrowing into a slightly overhanging, beat up, column-like finish. The ice was not good enough for gear, there was a bad knife blade and a faded and jammed TCU there for consolation. With a pack on it feels harder than your basic grade 4 ice. Once again, Erik styles the difficulties easily. One thing you realize after hanging around with Erik is that he is so smooth in his skill and systems that often he is faster than many other climbers. After pitch 7, the gully is skinnier and the ice steps more common. These “Narrows” of the climb really add to the route’s character. Most of a 50-60 degree frozen snow pitch would lead to a 40-50’ section of ice, usually steepening up as it topped out and then returning to snow. Unlike the parties that had climbed the day prior, the previous day’s sunshine had firmed things up and we encountered good snow conditions, only occasionally having to plod through deeper loose snow. Above pitch 12 we began simul-climbing smoothly again, finally stopping to belay at the Col. The view back down to the glacier 2500 feet below was impressive. It’s hard to keep track of standard pitches when you’re simul-climbing, especially using the 70M Blue Water 8.5 Excellence ropes that are cut generously and helped us climb belayed sections even faster. I’d been climbing in just a light poly top and an R1 hoody, my legs content in a light poly bottom, light pants and a light gore-tex shell but it was time to put on a warmer layer on the exposed windy ridgeline. This switch in terrain gave me a chance to test the versatility of the tools I’d chosen for the route. Through the winter ice season in the Adirondacks, I’d been using next season’s prototype of Cassin’s X-Dry tool. Cassin is a sister company of Camp and the new tool has an interchangeable handle that allows me to keep my familiar pick and curve combo but add on a more alpine style handle for the trip that plunged in the snow quite well. Leaving the Col for the summit ridge really opened up the views. The sharply corniced ridge had a nice feeling of exposure especially enjoyable with our excellent climbing conditions. The day prior had been above freezing and although there had been avalanche activity all around the glacier, today was colder, setting up for good, safe travel. The corniced ridge leading upward was no different and we turned the several potential pitches into one long simul-pitch and stood at the summit for a late lunch. Erik and Jay heading toward the summit on the Moose's Tooth in Alaska. The views were becoming sporadic now. One moment socked in, the next a partial view here and there through the passing cloud masses. The Moose’s Tooth had not disappointed us today, but we had a lot of descending to do yet so we didn‘t linger. A combination of V-threads and dead man anchors got us back to the Col. Then it was a matter of either trusting, or backing up the host of fixed anchors down the main route. Having a bit of extra cordage to replace and/or augment some of the sketchier anchors paid dividends. We got back to that huge tent at 9:30 pm and still had two hours of light to relax, organize and cook. It was a 17-hour round trip and it was extremely satisfying to sit on the glacier and relax having already succeeded on a route this trip. 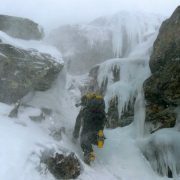 The next day’s weather was not as favorable, light snow turned to spin drift on routes like “Ham and Eggs” and other climbing parties weren’t as lucky as we were. Hearing a moderately worsening weather forecast we arranged for pick up the following morning. Again Paul flew in, this time with others and their gear already on board from the Tokositna glacier. Now fully laden, the Otter slid down the glacier on its skis gaining the added take off speed needed to become airborne. As the Otter climbed through the surrounding peaks the view was spectacular. The view, however, didn’t last long. The weather had been closing in all morning, the Route Canal was the last clear spot and it was closing in around it as we left. Ultimately, after our flight out, Paul suspended flight operations for the day. Despite our additional goal of another route on the Moose’s Tooth falling through, we felt lucky and satisfied having quickly succeeded without incident on a classic line with good partners. As we moved around the plane saying goodbye to others, a Dutch climber who we had skied past on the glacier the day before and had previously talked with our group approached just before we got on the plane to leave. “What’s wrong with him?” he asked as Erik was reaching to feel for the hand rail into the plane, not finding it instantly. I replied, “He’s blind.” The Dutchman asked “from the snow?” I said, “for most of his life.” The climber looked astonished, said “that’s amazing” over the noise of the prop and engine. We took our seats and flew away. 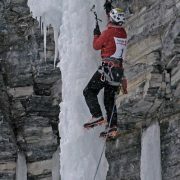 As an Everest summiteer and world traveler, Erik is so competent that many often don’t realize at first that he’s blind.